Plantation Shutters® need to be designed and installed with certain considerations in mind, for example the width of the opening, the depth of the reveal and the style and design that is best suited to the room. The consultant listens to the requirements of the client and then advises on the best design for those requirements. Plantation Timber Shutters most popular louvre width is 90mm. The louvres also come in a 60mm option if required. 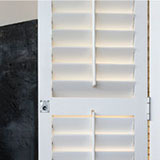 Plantation Security Shutters louvre width is 100mm and cannot be changed. Plantation Timber Shutters® under 1500mm high are not normally designed with a midrail unless otherwise specified. 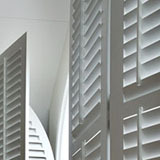 Plantation Timber Shutters® over 1500mm high are normally designed with a midrail. The midrail height can vary. Plantation Security Shutters® do not have a midrail, however the top and bottom louvres can be split so that top and bottom louvres can operate independantly. For the sliding system, a top track is always necessary as the shutters hang and slide along this top track. The installation of the top track happens at the same time as the installation. The bottom track is optional, however including a bottom track is the preferred solution. The necessity for a bottom track can be discussed between the client and consultant. The bottom track can either be installed before new floor coverings are installed in the case of a new build or renovation. In the case of completed opening at the bottom track, it can be cut into the tiles. Please see FAQ's for a full explanation.